Waveform capnography can now be used at all provider levels to better assess patients in respiratory distress, cardiac arrest, and shock. Capnography offers reliable feedback about the severity of a patient’s condition and how they respond to treatment. Here are five things you should know about waveform capnography. The capnograph is the waveform that shows how much CO2 is present at each phase of the respiratory cycle, and it normally has a rectangular shape. Capnography also measures and displays respiratory rate. Changes in respiratory rate and tidal volume are displayed immediately as changes in the waveform and ETCO2. Capnography assesses ventilation, which is different from oxygenation. Ventilation is the air movement in and out of the lungs, while oxygenation is the amount of oxygen inhaled by the lungs that reaches the bloodstream. Pulse-oximetry assess oxygenation, and works by measuring the how much of each red blood cell is bound with oxygen. It is expressed as a percent, or SPO2. A normal SPO2 is 92-96%. If a patient has slow or shallow respirations, and a high ETCO2 reading, this tells us that ventilation is not effectively eliminating CO2 (hypercarbia), and that the brain is not responding appropriately to CO2 changes. This may be caused by an overdose, head injury, or seizure. Pulse oximetry helps determine how much oxygen should be administered, and capnography helps determine when ventilation should be assisted with a bag valve mask. Conversely, if an unresponsive patient has a normal ETCO2, a conservative approach with close monitoring can be taken. While a rise in CO2 should stimulate someone to breathe, no effort should be needed to exhale it. Patients with asthma, COPD, CHF, and pneumonia must often exert themselves to exhale with accessory muscles. It is important to understand that patients in respiratory distress may inhale enough oxygen and have a normal pulse-ox reading, but still struggle to get air out. An elevated capnograph in this group of patients means that their effort is not effectively eliminating CO2 (hypercarbia) They may be progressing to respiratory failure from hypercarbia and fatigue, not hypoxia, and need assisted ventilation. In cases of bronchospasm, air is is trapped in the alveoli and inconsistently released. This creates a curve in the initial spike and plateau, or “shark fin” appearance. The worse the bronchoconstriction, the more pronounced the curve on the waveform, and the higher the ETCO2 is likely to be. If the waveform is upright and “crisp,” there is no bronchospasm and respiratory distress must be from another cause. Imagine a wheezing patient whose respiratory rate and work of breathing decrease after receiving albuterol. If ETCO2 also decreases, and their shark-finned capnograph shifts upright after receiving albuterol, this means the patient is responding well to treatment. If their ETCO2 increases and shark fin waveform becomes more pronounced, they are progressing to respiratory failure. 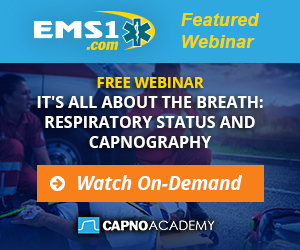 Treatment plans can be quickly adjusted when capnography is used to monitor trends. Capnography can also help guide how fast to ventilate the patient. Harm is associated with hypo and hyperoxia, as well as hypo and hyperventilation. Oxygenation should be titrated to achieve SPO2 of 92%, and ventilation should be titrated to achieve ETCO2 between 35 and 45 mmHG. Capnography has a ventilatory and circulatory component. Cells use oxygen and glucose to make energy, and release CO2 into the bloodstream to be carried to the lungs. The amount of exhaled CO2 depends on the adequacy of circulation to the lungs, which provides clues about circulation to the rest of the body. Low ETCO2 with other signs of shock indicates poor systemic perfusion, which can be caused by hypovolemia, sepsis, or dysrhythmias.